Often you can get apples for free this time of year. At the least, they are cheaper in the stores. 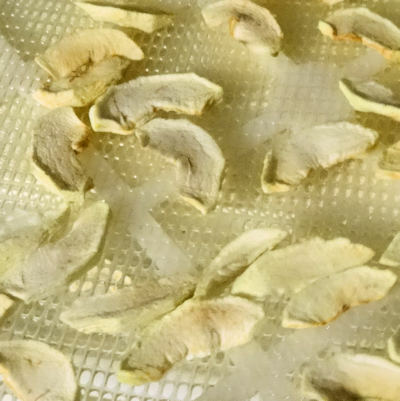 Why not dehydrate some and have them all year? It has to be easy, I do it. I cut the apples into wedges that are about 1/4 inch thick at the widest part. 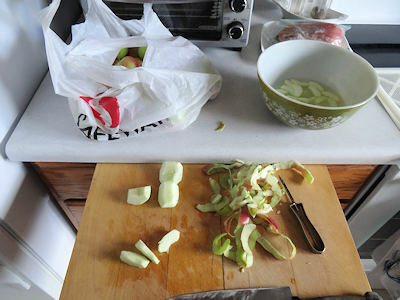 I dip the apples in a 50/50 mixture of bottled lemon juice and water. Again, this isn’t required but the dried apples will be a lot darker if you don’t do it. 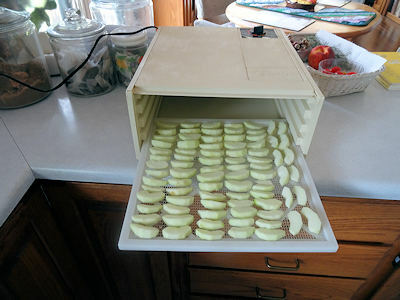 Put the apples in one layer in your dehydrator and set it for 150 to 170 F and let them dry. You can store them in a closed jar for up to a month and likely longer. However, if I am going to store them over 1 month, I usually freeze them in a vacuum sealed bag in the freezer. Thaw them in the bag so moisture doesn’t condense on them while thawing. 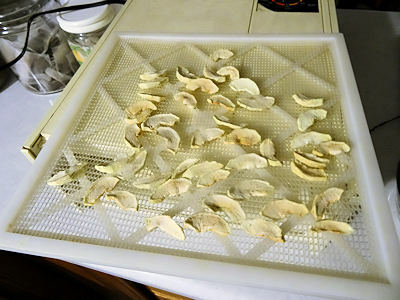 These may not look like much but the drying concentrates the sugars in the apples and they taste like candy. Kids love them! If you leave a bowl on the counter, they will disappear very quickly. You can also chop them up and use them in recipes that call for raisins.